E-mail has the distinction of being the most used service on the Internet. More than a 100 billion e-mails are sent every day. Unfortunately, only 3 out of a 100 e-mails are legitimate. Unsolicited Bulk E-mail, Spam or Junk Mail has risen sharply since 2003, thanks to home broadband connectivity becoming affordable worldwide. In 2003, junk e-mails accounted for 50% of all e-mails sent. The end of this year shall see this figure at 98%. It may astonish you that 80% of all junk e-mail sent comes from less than 200 individuals on this planet. "Spam lords", operating vast networks of compromised computers, are the new cyber mafia. There's money to be made in this digital eco-system. 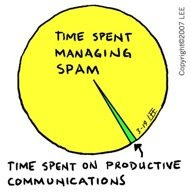 The spammers get paid for every 1000 e-mails sent. Human nature ensures at least 1 victim for every 100 recipients. What do the victims fall for? Dubious pharmaceuticals, imitation watches, stock scams, fake university degrees, immigration and job offers, military officials and widows in Africa who have a few million dollars to share with you, and many more. Junk e-mail is also the weapon of choice for fraud - in delivering "phishing" attacks. And things don't stop at scams and phishing. The spam lords need to grow their "botnets" - our computers, infected with viruses, that they control to pump out e-mails. From time to time, junk e-mail may offer you free software to clean viruses, e-greetings, and games. It is an amazing eco-system. Virus writers, scammers, spam lords and fraudsters form a sordid symbiosis. And they thrive because of our greed and gullibility. Spamhaus.org maintains the ROKSO (Registry of Known Spam Operations) database which tracks spam lords. August 2008 lists 117 spam lords, 4 of which are in India with "Herbal King" at the #1 spot in the top 10 worst spammers list. VSNL International and Reliance Globalcom, along with Verizon, Sprint, France Telecom and China's Hi-Net feature as top 10 negligent ISPs when it comes to spam control. We need to be educated about the dark side of the digital economy. I urge you to read the post "Spam - Motives, Origins and Statistics" which has details about spam lords, shady domain registrars, errant ISPs, spam contents, and more. How do we deal with the menace of junk e-mails? Stay tuned for the next Cyberwatch. In the meantime, if you receive an e-mail that sounds too good to be true, it most probably isn't.